Editor's Note: What do you think? Are there strategies your community (or organization) has used to help promote affordable housing? What challenges have you faced? Let us know by commenting on our Linkedin group discussion about this posting. The report's authors, Janet Viveiros and Rebecca Cohen, looked at the role of advocacy and communication for affordable housing through two lenses: public opinion research, and language and messaging. They examined findings from 35 research studies, as well as current data. 1. Not surprisingly, housing cost issues tend to have the most traction in high-cost areas. When segmented by housing market, 28% of respondents in higher-cost markets selected housing costs as the most worrisome challenge, compared with only 10% in lower-cost markets. The same study found that in the highest-cost areas, one in five respondents identified the lack of affordable homes as the biggest threat to America’s economic well-being, as compared with only one in twenty in the lower-cost markets. 3. Homeownership solutions are particularly attractive to the public. Even after the mortgage crisis, survey respondents were more comfortable with homeownership options versus rental housing options. 4. Personal familiarity with housing challenges has increased. As a result of the recent housing crisis, heightened concerns about one’s own ability to afford a mortgage affects a household’s perspective on housing affordability, as well as growing awareness of the neighborhood impacts of foreclosures. 2. 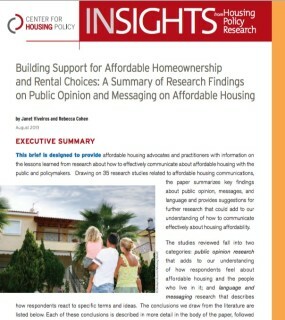 Describe programs with terms that affirm that the beneficiaries deserve assistance, for example “working families,” “homes within reach of working families,” or even a change in language from "affordable housing" to “housing that is affordable,” which led to higher rates of positive responses to affordable housing initiatives in National Association of Realtor surveys. 3. Make it clear that the whole community benefits stating, for example, “It is good to have diverse communities, and an adequate supply of affordable housing promotes racially and ethnically diverse communities.” 3 Also, emphasize research findings that decent, affordable housing has a positive impact on overall community health, economic investment, and education. Stressing these positive benefits can help to further local acceptance of affordable housing. 4. Appeal to core values such as choice, hard work, balance, fairness, and opportunity. Affordable housing provides more options and security for residents of a community -- another rung on the housing tenure ladder. By making the relevant issue an increase in the supply and variety of housing, the message may be understood and appreciated by all residents of an area (i.e. potential consumers). 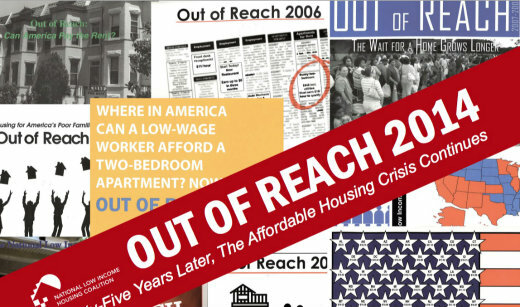 What does this report mean for those involved with the creation of affordable housing options? 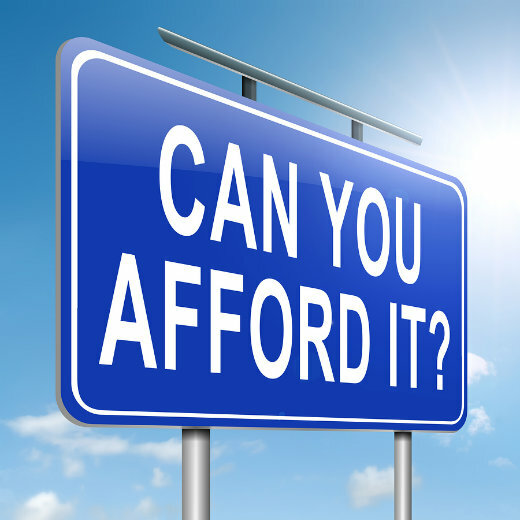 As planners well know, affordable housing can be a passionate subject, usually taking two extremes: preaching to the choir, and opposition to what is commonly viewed as government subsidies (of both the housing and the residents). Because there is often a rift or breakdown in the understanding of the need for affordable housing, communication becomes paramount. 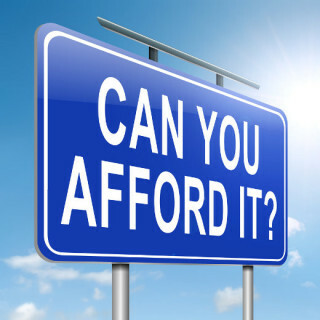 Many people are unaware that “affordable” housing is quantified as paying no more than 30% of your income for your housing, creating a relationship between income and the cost of housing and, thus, tying the need for affordable housing to the economy of an area. When given such an understanding of “affordability,” most people immediately calculate what they are personally spending on housing as compared to their income. The authors stress, as the point just noted in the preceding paragraph indicates, that general issues (e.g., "the affordable housing problem") have more relevance when considered in a local context. Again, people will first use themselves as a frame of reference -- and then look around themselves for confirmation. Interestingly enough, "Out of Reach 2014," 4 a recent report released by the National Low Income Housing Coalition looked at the concept of “the housing wage,” that is, the hourly wage a full time worker must earn to afford a 2-bedroom rental unit at fair market rent while spending no more than 30% of his/her income on rent. Explaining housing affordability (or, rather, lack of affordability) in specific terms like a "housing wage" can make it easier for people to grasp the specifics of the problem in their own state and community. What's more, housing advocates can point out that getting to a healthy vacancy rate is important for a range of issues: encouraging new employers and jobs, retaining younger populations, boosting the economy and creating increasingly lively public spaces, to name a few. Gaining an understanding of what we need and what we mean by affordable housing is a necessary step to building support. 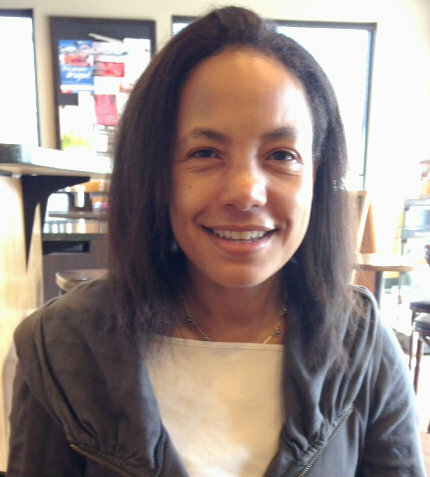 Owiso Makuku is a city planner with over 15 years of experience in land use planning and community development. 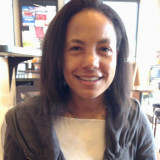 She has worked with the cities of Burlington (VT), Cambridge (MA), New York (NY), and Detroit (MI). She most recently completed a two year fellowship in Detroit, as part of the inaugural cohort of the Detroit Revitalization Fellowship Program, working from 2011-2012 in the Mayor's Office in Detroit and, from 2012-2013, in the Governor's Office of Urban and Metropolitan Initiatives. She earned a BA in Art from Middlebury College and a Master of Architecture (MArch) and Master of City Planning (MCP) from MIT.